All ViewConn microscopes are designed with a ruggedized cover for use in the field, and built-in cleaning cassettes allow you to inspect and clean patchcords all with a single device. A USB output allows you to simultaneously view endface images on your PC. The VC-6200 enables users to inspect patchcord connectors for contamination, clean the connectors, and re-inspect, ensuring optimal signal quality while reducing installation time. The USB port allows full image capture capability for documentation - all from one hand-held unit. The VC-6200-PL enables inspection of both patchcord and in-adapter connectors at the flip of a switch without the need to change tips. Inspection and cleaning time is significantly reduced with this compact hand-held unit. The USB port allows full image capture capability for documentation. The VC-8200 is an integrated system for optical connector inspection, evaluation, documentation and cleaning. With built-in WiFi , ViewConn Pro can send its Pass/Fail analysis reports via email to other locations or store them within the unit. An integrated power meter can also be added. The VC6-OPM and VC6-OPM-H are optical power meters designed to integrate with ViewConn® so you can inspect, clean and test with a single device. With 6 calibrated wavelengths, the power meters are able to store 999 readings and can download the results to text or Excel files. Our Connector Inspector video microscopes feature a hand-held probe which enables inspection of both patchcords and hard-to-reach in-adapter connectors. Connector images can be captured and stored on your PC with an optional USB2.0 adapter. The CI-1100-A2 includes a fold-up 3.5" LCD monitor, a charger/adapter and a carrying case. The CI-1100-AB2 also includes a USB2.0 adapter and ConnectorView software to display and capture images onto a PC. The CI-1000 is no longer available, although Lightel continues to offer support and many accessories for the unit. For new or replacement tips, please visit our Series 1 Tips page for ordering information and availability. The DI-1000 and DI-1000L-PRO inspect fiber optic connector endfaces, providing clear sharp digital images on your Windows® PC. The DI-1000 and DI-1000L-PRO use LIGHTEL's Series 2 Tips and come with a soft case designed to fit easily into a standard laptop case. The DI-1000 connects directly to your PC through the computer's USB2.0 port. Powered by the USB connection, it features an ergonomic design, built-in image freeze/capture button and digital zoom through our free ConnectorView software. Powered by your PC's USB port, the DI-1000L-PRO provides automatically-centered analysis reports with its included ConnectorView Plus Pass/Fail software. The DI-1000MPO+ incorporates the same features and uses the same single fiber tips and accessories as the popular DI-1000, but adds additional X- and Y-direction scanning knobs enabling the user to scan in both directions with just one hand. Connecting the DI-1000-WIFI to a DI-1000 probe converts the probe's USB video output into a wireless signal, enabling users to view live images of a fiber endface on their smartphone, tablet, or PC. Lightel's benchtop scopes use a USB connection to Windows®-based PCs and tablets to view and save clear detailed images of connector endfaces. Our benchtops provide cost effective innovative solutions for inspecting connectors where standard Fields of View may not be adequate. Each benchtop scope comes with easy to use software designed to take best advantage of that scope's capabilities. The FV-3100 is a benchtop digital microscope designed for inspecting and capturing images of large core fiber. The large 1400µm x 1000µm Field of View enables inspection of fibers as large as 1mm, with digital zoom available for more detail. The AV-4800 is an automated inspection system for MTP and MPO connectors. With a scan and capture time of under 15 seconds, the ArrayView makes it simple to inspect these connectors and document the entire connector endface. 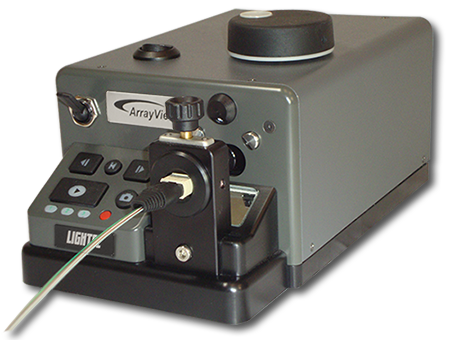 Lightel offers a variety of products to keep your Lightel video microscope a vital tool as your inspection needs grow or change. With more than 140 inspection tips, Pass / Fail analytical software, integratable power meters and more, Lightel is an industry leader in providing innovative, expandable solutions. ConnectorView Plus software is designed for users needing portable automated Pass / Fail software to check for fiber optic connector endface contamination. Whether you want to improve objective evaluation of connector cleanliness in the field, train others to recognize acceptable standards, or improve documentation, ConnectorView Plus is designed to save time and improve your accuracy. LIGHTEL currently offers more than 60 standard and specialty tips for our Series 1 video microscope probes (black colored probes). All listed tips fit the CI-1000 and VC-6100-PL probes. These tips can be used with the CI-1100, DI-1000 or VC-6200-PL probes (gray colored probes), by using a PT2-CI/ADAPT adapter. All ViewConn tips are designed for inspecting patchcords (male connectors). Most tips are universal tips for that ferrule size and polish type. Tips are available for both the VC-6100 and VC-6200 models. LIGHTEL offers a variety of products which can add new functionality to your inspection products. LIGHTEL offers a variety of quality fiber optic cleaning products to complete your own custom Inspection and Cleaning kit. Contact LIGHTEL or your local LIGHTEL Distributor for assistance and recommendations.